Brazilian midfielder Lucas Leiva will be missing from the squad for up to three months with an injured thigh said Liverpool manager Brendan Rodgers but he will not be allowed to sit around the house and recover as Reds boss Rodgers has other plans for the 25-year-old. 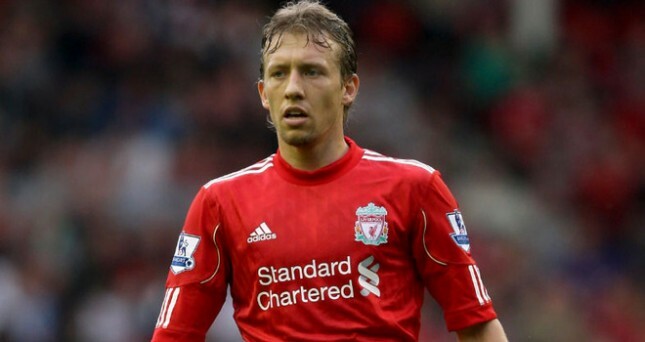 Leiva limped off the pitch after five minutes into the match against Premier League champions Manchester City at Anfield. Rodgers said: “It is very unfortunate. He has worked ever so hard to come back and he has been an outstanding player for me and person off the field as well. “The indications are two to three months. It is quite a unique injury at the top of his right thigh. You might recall that Leiva missed most of last season with an anterior cruciate ligament injury sustained at Chelsea last November during the Reds 2-0 in the League Cup quarter-final. Rodgers is going to use the young Brazilian as a scout for the club while he is unfit to train saying it will do him good to stay active in the game. Lucas is at home for a bit and he has good days and bad days,” added Reds manager Rodgers. “We will keep his spirits up and I’m going use him to go out and look at some games for me with my analyst. Tactically, he’s very good. I want to make sure that he stays in the game.